Italian extreme folk metallers Korrigans from Pontine Marshes, Lazio released last year their debut full-length, entitled “Ferocior ad Rebellandum“. The band started in 2011 with the intention to mix folk music with extreme metal. It took them some time to gather the complete line-up and define their sound, before they record and release the 6-track demo “Korrigans” in 2012. The demo gained the attention of the Irish label Nemeton Records, who signed Korrigans and released their debut album on the 6th of October 2014. Korrigans offer us a mixture of epic folk metal with some extreme blackened metal elements. “Ferocior ad Rebellandum” includes 10 songs with a total duration over 52 minutes. The band’s melodies are based on European folk and Celtic music and their orchestrations are dominated by many traditional instruments, like accordion, tin and low whistles and bouzouki. Of course distorted guitars and the rest of the “typical” metal instruments are ever present in the album and despite their somehow “raw” sound, the overall result is very melodic and balanced. The clever use of synths helps the band to present a more solid sound. There is a quite uplifting mood in the album and the atmosphere moves from happier folk tunes to some more epic passages. Vocals are equally variable with their music, ranging from typical epic death black metal growls and extreme black metal shrieks to epic clean male vocals and choirs. In my opinion, Korrigans still need a lot of work in the production, since their instruments don’t sound too natural, both the metal and the acoustic ones. Of course it is more than ok for a first album, but I believe that the level of their compositions deserves a better sound. Their songs are really great! The folk melodies are really captivating, both the acoustic and the metalized ones, whether they are existing tunes, or new compositions (I can’t tell). The combination with extreme metal is also inspired, creating wonderful harmonies and contrasts, while the endless dialogue between the various vocals types completes their sound puzzle. All of their lyrics are in their native language, included in the CD booklet. “Ferocior ad Rebellandum” is a concept album that, among the historical testimonies of Tito Livio and the ancient pagan myths, follows in the footsteps of the wars between Romans and Volscians and the rebellion against the oppression by Rome. 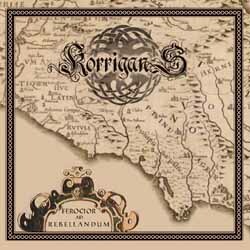 Korrigans offer a really beautiful debut album, recommended to fans of epic folk metal, especially if you like extreme metal elements added in the mix. I really enjoyed this album, which is full of catchy melodies and interesting compositions. I really believe that with a slight improvement of their sound they can make really great things! ”Ferocior ad Rebellandum” is released via Nemeton Records in a standard jewel-case CD edition with 16-page booklet. All graphic work and layout is by Davide Cicalese. You can visit the band’s official pages below for more info about them and to listen to their music.